The Audi Q5 comes powered by a choice of inline-4 turbo and V6 engines driving all wheels. 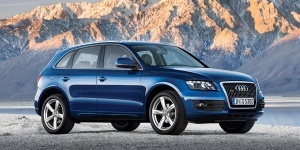 The Q5 features a well-built cabin that includes a sliding and reclining rear seat and three-zone air con. For 2012, an S-Line Plus package is available on V6 models. Find the used Audi Q5 of your choice from a dealer in your area. Search our used car listings now.